In the week just ended, the Minister of State for Minerals, Hon. Peter Lokeris, Commissioned WWF’s solar PV systems for the 51 institutions at Riki Health Centre III in Arua District. 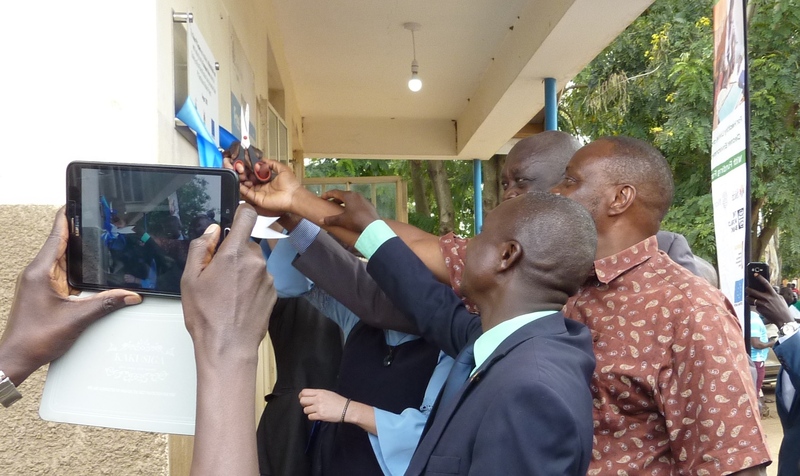 Lokeris, while launching the systems commended WWF for the practical innovation that is going to improve the education and health services in over five districts. According to the Project manager EU Solar Energy, Edna Nyamwaka, the solar installations in the 51 schools and health Centres have already improved education. “We have schools that have since the installation put in place boarding sections. This means increased learning and reading hours for the pupils”, she said adding that the installations in health facilities are now reducing the maternal death statistics because mothers can now access services in the night. "Refrigeration of vaccines has been enabled and 24-hour lighting has been guaranteed," said David Binega, the In-Charge, Riki Health Centre, which lies 25kms from Arua town and receives 1,500 patients each month, majority being women. "As a result of this solar, we are now able to respond to emergency cases in the night and administer vaccines to new born babies in time which was not possible before," he added. 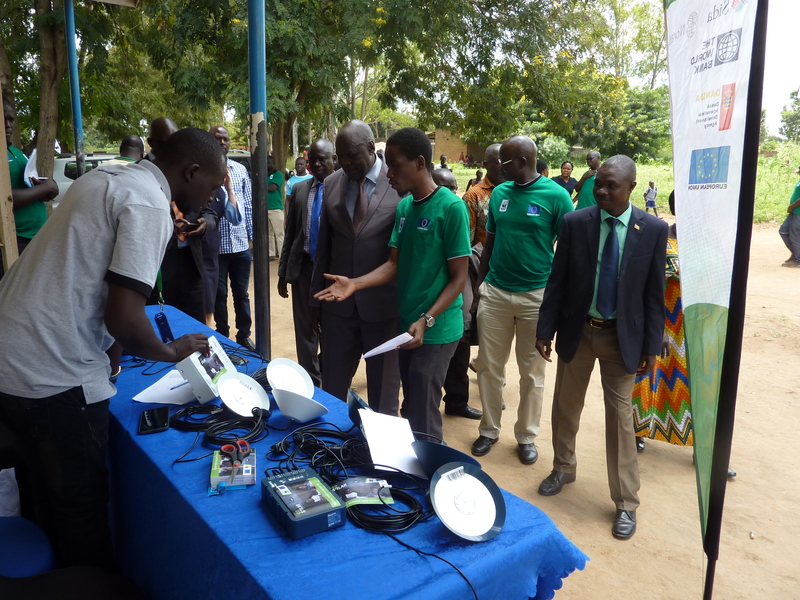 For Gilbert Ondroma, the Deputy Head Teacher at Okufura Secondary School, he believes that solar lighting has given his students a chance to compete with urban schools that have access to grid electricity. "My students can now revise in the night. This never used to happen because we were in darkness," he asserts. The EU representative at the launch also noted that while the social services were improving, the installations were contributing to a reduction in environmental pollution. WWF (UCO)’s Country Director, David Duli congratulated the 20 Health Centres and 31 schools upon these great milestones. “You are taking lead in an important process that we want our government to take to all other parts of the country”, he said. 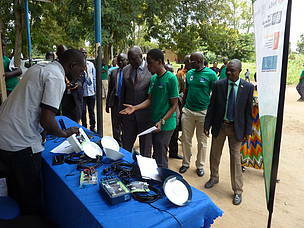 World Wide Fund for nature-Uganda Country Office (WWF-UCO) is implementing the Scaling-Up Rural Electrification Using Innovative Solar PV Distribution Models Project with an overall objective of to improving rural livelihoods and reduce the greenhouse gas emissions through wide spread access to clean and renewable sources of energy by 2025. The project complements government development agenda anchored in Uganda’s National Development Plan (NDP) (2010-2015) which set a target of “electricity for all” by 2040 and Uganda’s Sustainable Energy for All (Se4all) Initiative Action Agenda. Minister of State for Minerals, Hon. Peter Lokeris, flanked by David Duli, Country Director WWF and Arua LC V Chairperson Achema Genesis commissions a 1,000W Solar System at Riki Health Center III, in Arua district. Hon. Peter Lokeris inspects Solar Home Systems distributed by WWF to households through local CSOs to cut back on use of kerosene lamps and emission of greenhouse gases.